It is a very big file and will take a while to download, so be patient. 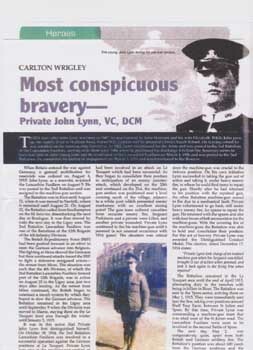 Private John Lynn VC, DCM. 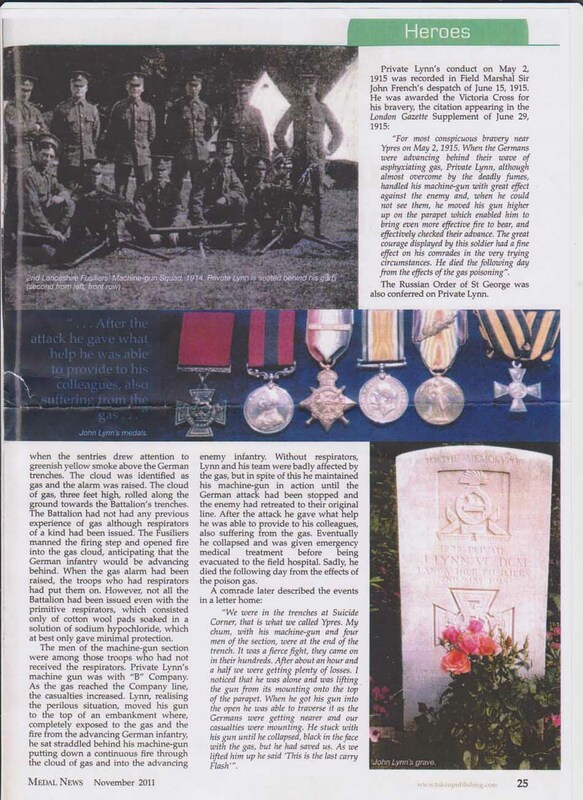 Lancashire Fusiliers - The Forgotten Hero. John Lynn, who won the VC at Ypres, May 1915, was born in Forrest Hill, South London in 1888 and spent his early years in the area. However the only memorial to John, in England, appears to be the one at the church of St Mary the Virgin, Bury, Greater Manchester. Unfortunately information on John is sparse. His army service records do not appear to have survived. (I cannot find trace of them amongst the 'Unburnt Documents' held at the PRO, Kew.) 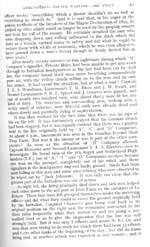 The information that is readily available tends to concentrate on the events leading to his winning the DCM and the VC while serving with the 2nd Battalion the Lancashire Fusiliers during WW1. 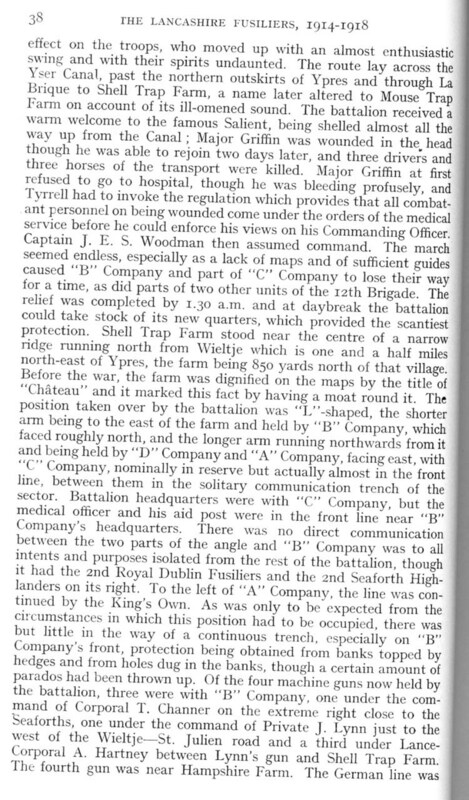 An extract from the "London Gazette," dated 29th June 1915, records the following: -"For most conspicuous bravery near Ypres on 2nd May 1915. 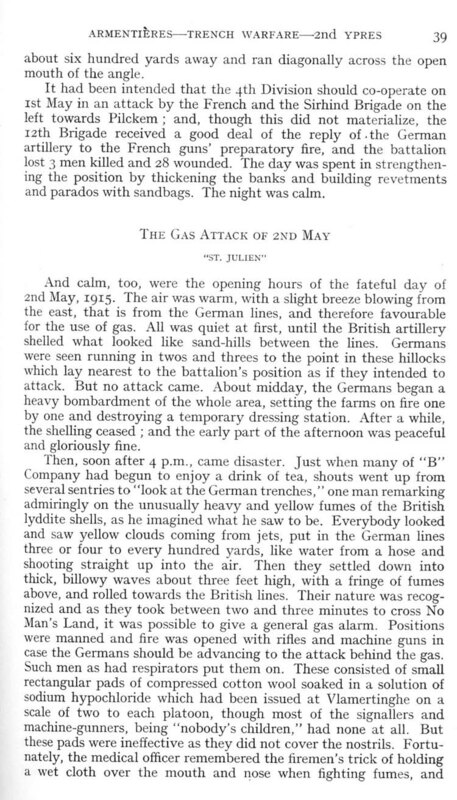 When the Germans were advancing behind their wave of asphyxiating gas, Pte. 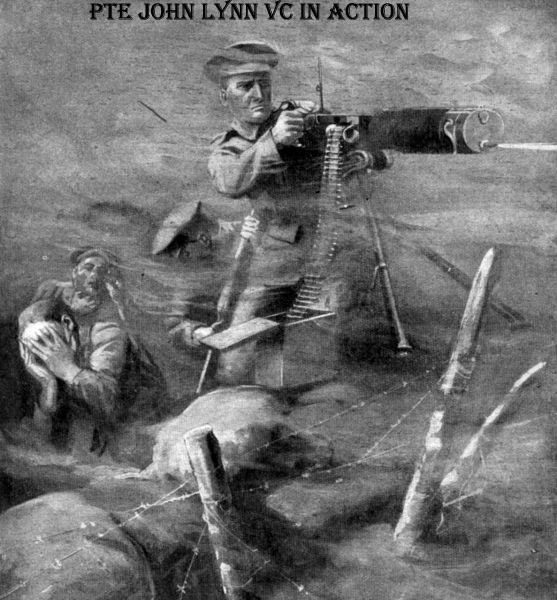 Lynn, although almost overcome by the deadly fumes, handled his machine gun with very great effect against the enemy, and when he could not see them he moved his gun higher up on the parapet, which enabled him to bring even more effective fire to bear, and eventually checked any further advance. The great courage displayed by this soldier had a fine effect on his comrades in the very trying circumstances. He died from the effects of gas poisoning." As a result of this action John also had the rare distinction of being named in Sir John French's dispatches. 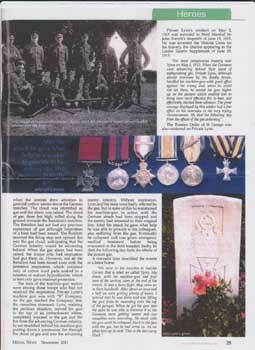 John was also awarded posthumously, on the 25th August 1915, the Cross of St George 4th Class (Russia). John died the day after the action, which gained him the VC. 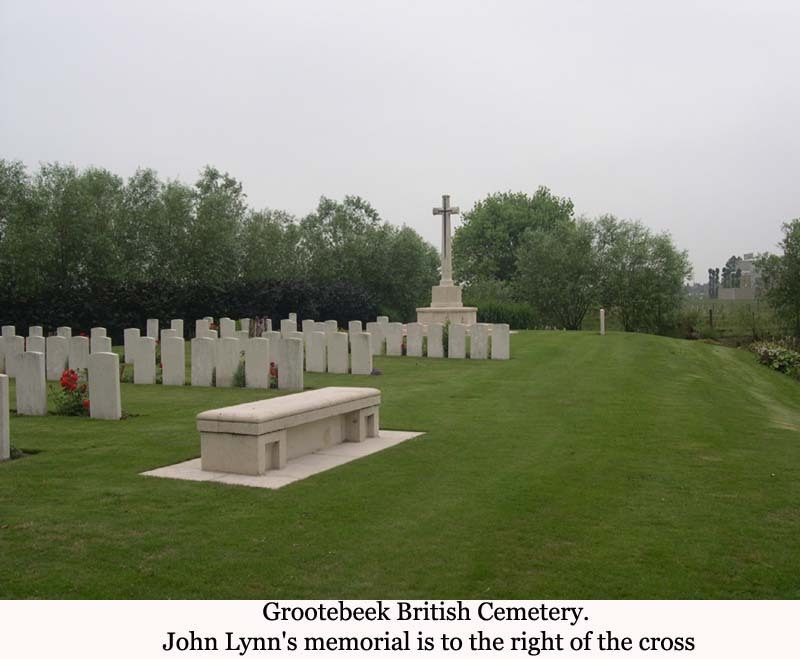 He was buried in Vlamertinghe Churchyard, Belgium but his grave was later destroyed by shellfire and there is now a special memorial stone erected to him at the Grootebeek British Cemetery. John's name is also listed on the WW1 memorial in St Mary's Church, Bury, Lancs. This appears to be the only memorial to him in England. Although John's gallant actions are well recorded, as noted earlier, knowledge about John, his parents and foster parents is sparse. The following is a summary of what is known. A recently discovered birth certificate shows John was born on the 21st April 1888 at 6 Helvetia St, Perry Hill, Catford. London. (This differs from other records, which give a birth year of 1987.) His mother was a Lily Lynn and his father was unknown. An Elizabeth Harrison, of the same address, registered John's birth under the name John Walter Harrison Lynn. Elizabeth and her husband, Phillip, apparently acted as John's foster parents throughout his childhood. What is known suggests that John may have had a difficult childhood. He attended Christ Church School, Forest Hill, London, SE23 and his family home was variously 20 Hindsley Place or 2 Church Vale, Forest Hill. His foster mother was a laundress/ washerwoman. For some unknown reason in1899, possibly as a result of the death of his foster father, John came under the care of the Lewisham Board of Governors. On the 1/9/1899, he was sent to the North Surrey District School, Anerly, Upper Norwood, Surrey. The school records show he ran away from the school once during the short period he was there. On the18/10/1899 he was moved to the TS Exmouth, a training ship, which was moored on the Thames at Grays, Essex. The records show that his behaviour generally was very good and towards the end of his stay on board the Exmouth was rated First Class on the Clarinet but only Second Class in Seamanship and Swimming. 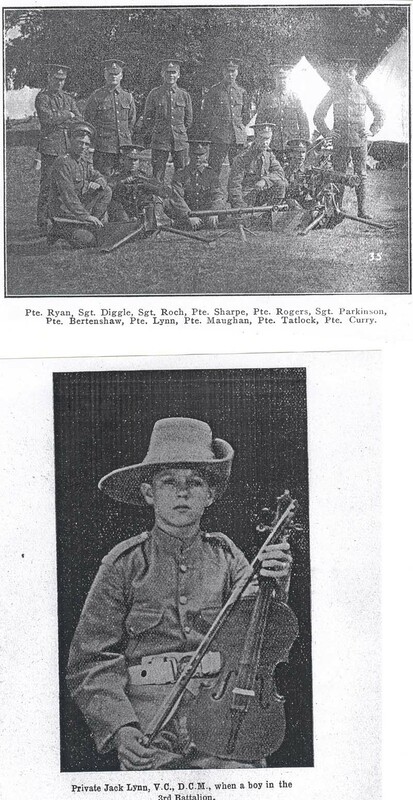 On the 12/01/1901 John, with Elizabeth Harrison's approval, joined the 3rd Battalion, Lancashire Fusiliers as a band boy. He joined under the name of John Lynn and also appears to have been registered as Irish. John served in the army until 1912/13; prior to his discharge he was stationed in Bury and met and became engaged to Alice Mason. 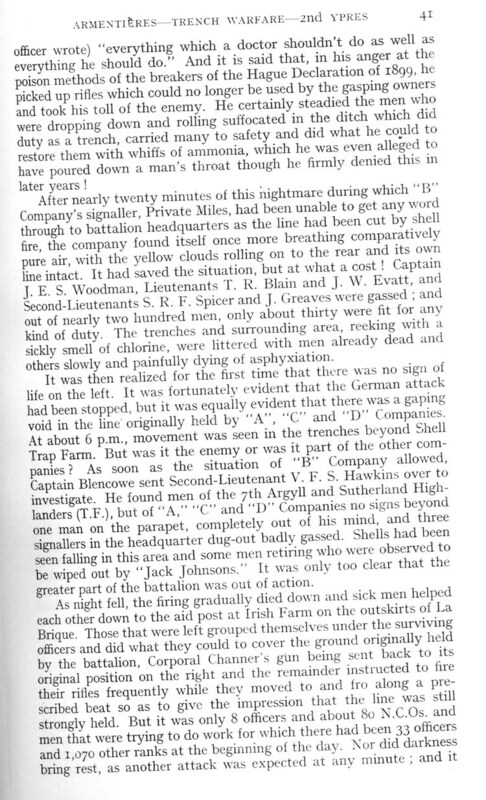 On his discharge he began living in Gorton, Manchester with the family of his fiancée, Alice Mason, while working at Armstrong-Whitworth Ltd.
John and Alice were due to be married in November 1914 but unfortunately John, as a reservist, was recalled to the 2nd Battalion of the Lancashire Fusiliers at the outbreak of war. Alice was on holiday and they did not get a chance to say goodbye before John went with the Battalion. John and Alice's rearranged plans for marriage unfortunately were overtaken by his death. In March 1916 the War Dept. sent his medals to Alice, as his legatee. In 1955, Alice presented the medals to the Lancashire Fusiliers Museum in Bury where they are now held. So who was John Lynn? We know he was a hero, but who was he? Was he a good soldier?
" Who was Lily Lynn, his mother? Who was his Father?
" Who were the Harrison's, his foster parents?
" Did he have any foster brothers and sisters?
" Are there families living today who could claim a direct link to John?
" Was he Irish? The only information, which supports this claim, comes from a web-site www.firstfusiliers.com. Was this a clerical error at recruitment or later, or did it link back to his real mother or Father. 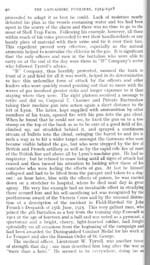 (The Web-site no longer appears to be supported but was linked to the Lancashire Fusiliers Museum site.) The Commonwealth War Graves Commission list him as an English Soldier.
" Are there descendants of the Mason family still alive in the Manchester area, who might know something about Alice? She had 3 sisters and 2 brothers. Alice, who was born in Gorton Manchester in 1887, does not appear to have married, but it is known that a grand nephew, Alan Murdey lives in Essex. If you can add anything to this story of John Lynn, please e-mail the Editor of this web-site or myself. To the Secretary of State-for-War, War Office, London, S.W. The eighth Despatch of Field Marshal Sir John French, Commander in Chief of the British Expeditionary Force. 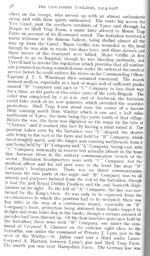 Printed in the Second Supplement to the London Gazette of 10 July 1915. The Despatch dealt with the intensive fighting at Hill 60 and in the Second Battle of Ypres, and with the less than wholly successful attacks of Aubers Ridge and Festubert. French is fulsome in his praise of Plumer: he does not mention that Plumer arrived to take the place of Smith-Dorrien, who French had sacked. 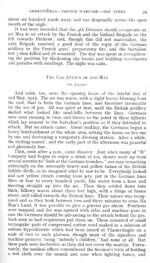 I have the honour to report that since the date of my last) despatch (5th April, 1915) the Army in France under my command has been heavily engaged opposite both flanks of the line held by the British Forces. During one of the heavy attacks made against our infantry gas was seen rolling forward from the enemy's trenches. 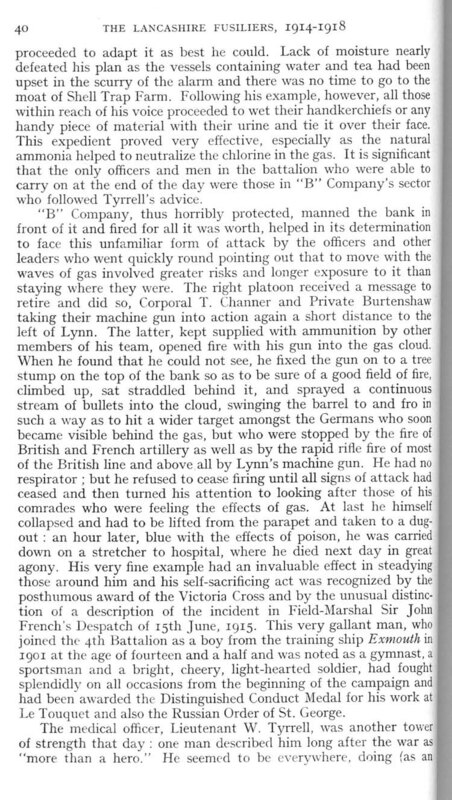 Private Lynn of the 2nd Lancashire Fusiliers at once rushed to the machine gun without waiting to adjust his respirator. Single-handed he kept his gun in action the whole time the gas was rolling over, actually hoisting it on the parapet to get a better field of fire. Although nearly suffocated by the gas, he poured a stream of lead into the advancing enemy and checked their attack. He was carried to his dug-out, but, hearing another attack was imminent, he tried to get back to his gun. Twenty-four hours later he died in great agony from the effects of the gas. Private James Smith of the 2nd Lancashire Fusiliers, who resided at 18, Albert Street, Middleton, was killed in action at St Julien on May 1st, 1915. This soldier who was 40 years of age, and enlisted on August 29th, 1914, going to the front in January 1915. He left a widow and six children. At the time of joining up, he worked for Messrs. R. Halliday and Company, with whom he had been employed for 25 years. 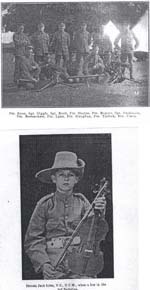 The late soldier was connected with St Peter's Middleton and had been 19 years with the Volunteers, Territorials, and National Reserve. He was a well-known runner and swimmer. 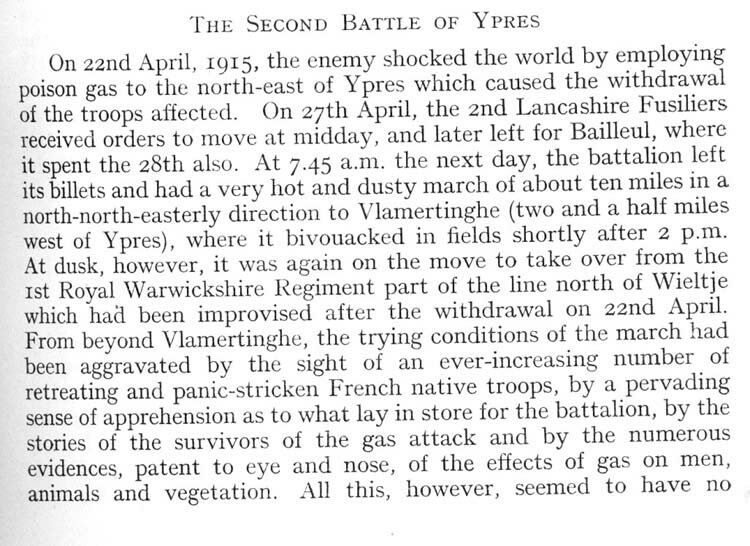 He died at 2nd Ypres, as the 2nd Lancashire Fusiliers were rushed to the front to stem the onslaught of the German Army as they used poison gas for the first time, which threatened the British lines. Private James Smith has no known grave, and his name is on the Menin Gate Memorial. Private Harry Hollows, of the Lancashire Fusiliers Trench Mortar Battery, died of wounds on October 24th, 1916. 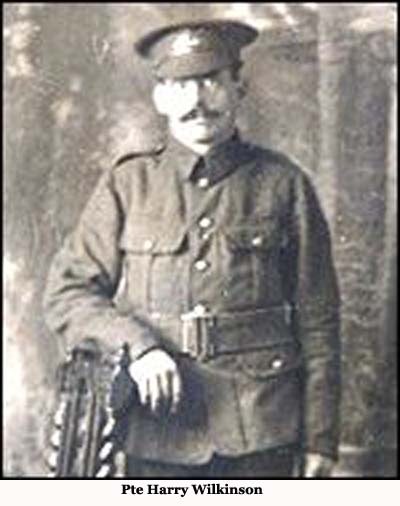 He resided at Oldham Road, Middleton, and was 20 years of age, and joined the army in March 1915, at which time he was employed by the Middleton Electric Traction Company. He was connected with St Michael's Church Tonge, and was a regular attender at the Sunday school. His mother received a letter from the sister-in-charge of the casualty clearing station in which he died. The letter states: "He was brought into our clearing station badly wounded in the head. We did all we could, but the brain was badly injured, and he died early this morning. He was quite unconscious when brought in last night. I am so sorry to have to send you this news but you will be glad to know he did not suffer." The late soldiers officer wrote: "I regret to inform you that your son was wounded on the 20th seriously, I fear, as he was hit in the head by a piece of shell. Private Hollows has been my servant since he joined the Lancashire Fusiliers, and when I was transferred to the trench mortar battery in July, he came with me. He was always most willing and I am very sorry to lose him." Private Harry Hollows is laid to rest at Grove Town Cemetery, Meaulte, France. 1st Battalion the Royal Regiment of Fusiliers. 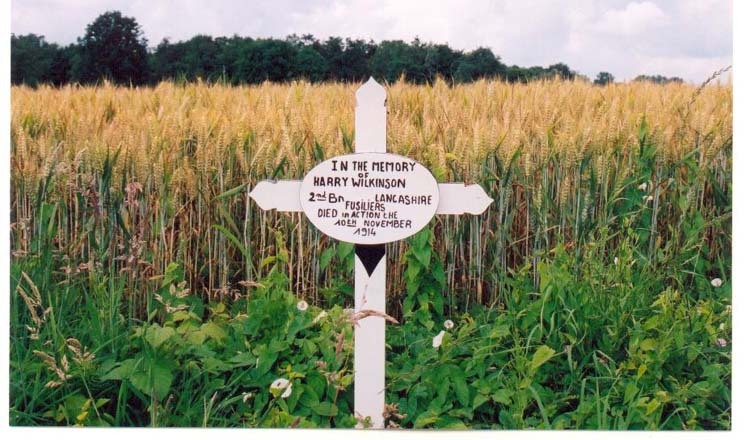 BURY Fusilier Private Harry Wilkinson was finally laid to rest close to where he was killed nearly 87 years ago. Three generations of his family were joined at Flanders by civic dignitaries, military representatives and members of the public as they watched his coffin, draped with a Union flag, a wreath of poppies and a beret bearing the primrose hackle of the Lancashire Fusiliers, was carried into the churchyard at Prowse Point Military Cemetery near Warneton, Belgium. Pte Wilkinson's remains were carried by six members of his former regiment. During the service on Wednesday, tribute was paid to the soldier's sacrifice and, as his coffin was lowered into the ground, a single bugler sounded the Last Post. A volley of shots was then fired over the graveside by members of the 1st Battalion, the Royal Regiment of Fusiliers, to remember the Bury soldier and father who died in the 'war to end all wars'. The Wilkinson family, who were traced as a result of work carried out by the Bury Times, said they were extremely proud that their brave relative had finally been honoured. 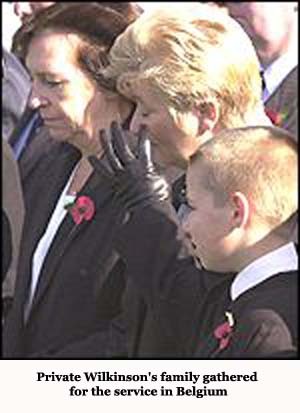 Nine-year-old Jay Wilkinson attended the funeral with his mother, Annette Wilkinson and his great-aunt, June Brammer, the Fusilier's 59-year-old granddaughter. 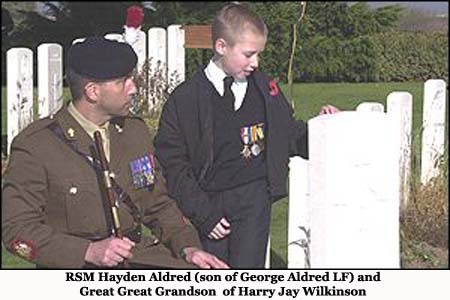 Young Jay was given the honour of wearing his great- great-grandfather's three military medals, the Mons Star, the War Medal and the Victory Medal, as he laid a wreath following the service. It read: "Harry, lost but now found. God Bless." Five hundred people, including the Duke of Kent, packed into the small, wind-swept cemetery, which lies along the former Flanders front line. 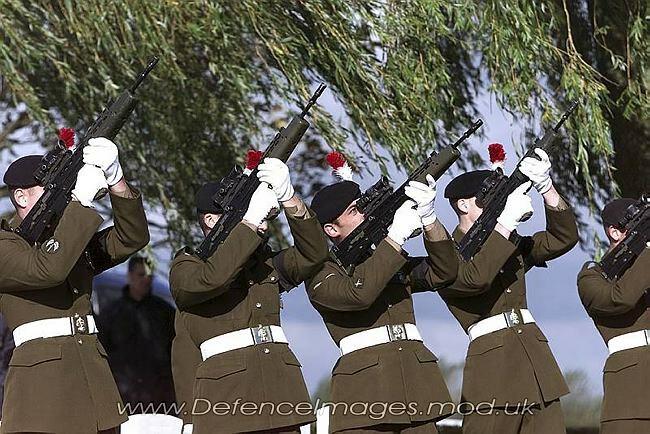 The Duke, who is the Colonel-in-Chief of the Royal Regiment of Fusiliers, senior military officers from the regiment, and other members of his family also laid wreaths at the graveside. Mrs Wilkinson said: "It has been nice to put him to rest at last." Pte Wilkinson's remains were the first to be identified in 25 years in both Belgium and France, after they were discovered in January last year. Mr Wilkinson's family laid wreaths at his graveside. Later on Wednesday Mr Wilkinson was due to be honoured again with the playing of the Last Post at the Menin Gate in Ypres. Since 1928 the Last Post has been played each day at 2000 to remember those commemorated on the gate war memorial. To mark the 25,000th sounding of the Last Post, a short service will take place at the gate on Wednesday afternoon, attended by the Duke of Edinburgh and Prince Phillipe of Belgium. As part of the commemoration a different soldier, sailor or airman killed during the 1914-1918 War is to be honoured each day for a year. According to military records, the 29-year-old cotton mill fire-beater had been shipped out to the front on August 23, 1914. He left behind his pregnant wife, Eva, and his six-year-old son, Harry, at their Lord Street home in Bury. He was then involved in non-stop action at Le Cateau, Marne and Aisne. His unit moved by train to the Ypres Salient and saw more combat at LeTouquet. Seven hundred of the 1,100 Fusiliers he had sailed to France with were either dead or wounded. Pte Wilkinson met his death, along with two other soldiers, during a raid on German-held trenches at a farm house in Ploegsteert Wood on November 10, 1914. His body was buried in a shallow shell crater by his brothers-in-arms. His remains lay under the earth until they were uncovered by Belgian amateur war historian Patrick Roelens, after the ground had been ploughed for the first time in 85 years. His metal military ID tag, and other Lancashire Fusilier artifacts were also discovered with Pte Wilkinson's remains. The Wilkinson family, from Luton, now intend to return on another pilgrimage to Ypres to honour Pte Wilkinson. They will also be meeting friends they have made as a result of the discovery of their ancestor's remains. Over 90 years after he was killed in action, Private Richard Lancaster of The 2nd Battalion The Lancashire Fusiliers, has been re-interred at Prowse Point Commonwealth War Graves Cemetery in Belgium today, Wednesday 4 July 2007. Pte Lancaster's remains were discovered by archaeologists in 2006 alongside two unknown soldiers who were also re-interred during today's ceremony. Born in Lancashire in 1882, Pte Lancaster served in the Regular Army from 1901-05, when he married Phoebe Porter in Burnley. The marriage certificate lists them both as weavers. He was mobilised in August 1914 and embarked for France, where he saw action at Le Cateau and Armentières. Pte Lancaster was killed in action on 10 November 1914 during a counter-attack south of Ieper (Ypres), near Ploegsteert Wood, only a few hundred yards from where the Christmas Truce would take place a month later. "We got to know on Good Friday last year," she explained. "I was just totally surprised and amazed. Then things just snowballed from there as the arrangements for today began to take shape. At the time I wasn't thinking about actually going to Belgium myself but it's good to be here." "I discovered through my grandmother that he died during the First World War. He was my dad's father, but my dad never really knew him as he was only four when his father died." "I had mixed feelings; I've been a little nervous and was just hoping that the weather would hold today. Everybody involved has been really fantastic though, particularly Sue Raftree and her team. "It's been a very emotional ceremony. Lots of soldiers were present in their ceremonial uniforms. Some people have travelled all the way from the UK, people that didn't even know my grandfather. "His name is commemorated on a plaque in a church in Burnley and some of the regulars to the church saw the story on the TV last year. They recognised my grandfather's name and decided they would come over to Belgium on the ferry and pay their respects by laying a wreath." The Honour Guard and Buglers at today's ceremony were from 1st Battalion The Royal Regiment of Fusiliers. They accorded Pte Lancaster and his comrades full military honours. "Today's events were especially moving and very professionally done by all those involved. The task at Prowse Point Cemetery was made a little harder by the fact that there were three coffins. "Although Private Lancaster was found with his identity discs, the other two soldiers were not, so we had to check through the records to establish exactly which of the bodies was Private Lancaster." In a separate service at nearby Tyne Cot Commonwealth War Graves Cemetery, the remains of an unknown Lancashire Fusilier were also re-interred today. The remains were found in May 2005 during archaeological excavations on the former Ypres-Roulers railway, 300 metres from Tyne Cot cemetery. On 9 October 1917 six battalions of the Lancashire Fusiliers took part in a final push to take the railway and the ridge at Poelkapelle. 307 men were killed in action; 247 of them have no known grave and are commemorated on the rear wall of the cemetery. Following the ceremony the Memorial Museum Passchendaele 1917 unveiled a plaque on the spot where the soldier was found and where a preserved section of the wartime railway has been restored. This now forms part of a walking and cycle path. The re-interments in Belgium come eight days before the state ceremony to mark the 90th anniversary of the Battle of Passchendaele, also at Tyne Cot Commonwealth War Graves Cemetery. On Wednesday 4th July four soldiers from the First World War were laid to rest in Belgium. One was clearly identified as Private Richard Lancaster of the 2nd Battalion of the Lancashire Fusiliers who died on the 10th November 1914. He was found with two other bodies who may have been LFs but there was not enough evidence to prove it. The other body was that of a soldier, possibly and officer from the TA Fusilier Brigade in the 66th East Lancashire Division. He was killed on the 10th October 1917 during the battle for Passchendaele. The Drums Platoon from the 1st Battalion provided the Carrying and Firing Parties and throughout maintained the best traditions of the Regiment. Richard Lancaster and the two unidentified bodies were buried at the Prowse Point Military Cemetery near "Plugstreet Wood" to the south of Ypres. The unidentified officer was buried at Tyne Cot Military Cemetery. For future reference a permanent memorial to the LFs at Passchendaele will be created at the spot were the officer was found on the old railway line close to Tyne Cot cemetery. The evening of the 4th saw the Drums Platoon performing at the Menin Gate Ceremony. Their performance was first class and they have been asked back for the 11th November. The Regimental Museum was instrumental in the identification of the body and finding surviving members of Richard Lancaster's family. Indeed the funeral reunited several members of the Lancaster family who had never met. As requested by the Joint Compassionate and Casualty Centre, the MoD department responsible for the overall coordination of events, on the Tuesday before the funeral, the Museum provided a briefing and tour of the battlefield for the family . Following the funeral on Thursday, the Museum provided a tour of both battlefields for the Fusiliers from the 1st Battalion who were also accompanied by members of the Lancaster family, uniformed members of the Great War Society and the local archaeologists who discovered the body of Richard Lancaster. The event generated considerable media interest and article appeared on television, radio, national and local newspapers. There are a further 15 LFs recorded as being buried in that area with no official grave, so watch this space.